The festive season is almost here, the time when everyone in India is in search of cheap and beautiful looking gift options. And for some reason, everyone ends up buying a showpiece of Lord Ganesh as a gift, maybe because It's the safest option and a symbol of blessing and prosperity as well. If you too are looking for a gift option, then here is a new design of Lord Ganesh holding a fiddle in his hand. This showpiece can either be placed at the entrance of your house or anywhere you like. This showpiece is made up of Polyresin, which makes the surface of the showpiece smooth. The figure of Lord Ganesh in covered with bronze paint which creates a rich combination with a black body. When someone will look at this statue of Lord Ganesh they will surely feel at peace. This can be a very good gift option as well as you can keep it as a showpiece in your home too. 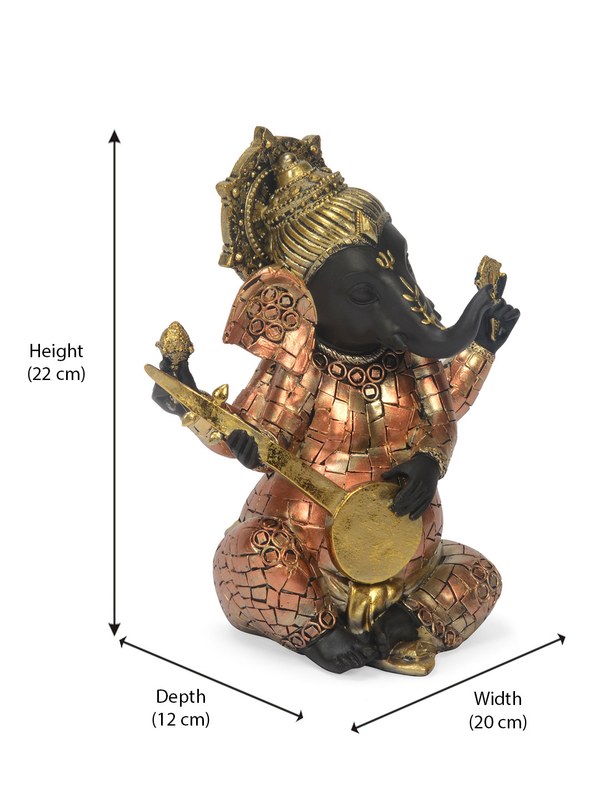 Come and buy this beautiful bronze colour Musical Ganesh Fiddle Showpiece from @home before the stocks last.